It was the second time in just a few months that the hard truth smacked me right in the face! My 15 year old son had no idea who the Lone Ranger was. Some months before a younger woman I met had confused American comedy legend Jack Benny with less than legendary British comedian Benny Hill. 77 Sunset Strip <snap, snap> was a cool L.A. private eye show, or at least as cool an L.A. private eye show as you could have starring Efrem Zimbalist Jr. <snap, snap>. It did have its slicker elements in Jeff Spencer as played by Roger Smith, later to be Ann-Margret’s sadly disabled husband, and Ed “Kookie” Burns, whose “Kookie, Kookie, lend me your comb” greasy hair set off a national craze, only to have us laughing at it a decade later. But 77 Sunset Strip’s <snap, snap> greatest cool was in spawning a spate of cookie cutter follow-ups, all from 'the Studios of Warner Brothers,' which planted cookie cutter private eyes in Hawaii, Miami, and points beyond and made a full-fledged star out of <snap, snap> cookie cutter cut-out Troy Donahue. “Dobie! Wants a girl who’s dreamy. Dobie! Wants a girl who’s creamy.” And what a dreamy, creamy cast of supporting characters The Many Loves of Dobie Gillis had: beatnik Maynard G. Krebs, proof positive that Bob Denver was a talented comic actor before he set sail for a three hour/life long trashing of his career; Thalia Meninger, representing our first panting look at the incredibly gorgeous Tuesday Weld; Herbert T. Gillis, Dobie’s lovable but blowhard dad, a proud veteran of “WWII, the Big One!”; rich kid Chatsworth Osborne Jr.; and even Warren Beatty as a proto-Chatsworth in the early episodes. Yes, Dobie --- in the person of Dwayne Hickman --- wanted a girl to call his own, and boy so did we. And even as Dobie Do (as Chatsworth called him) fades away, a lot of us still Dobie-Do! There were many jingles from “Plop, Plop, Fizz, Fizz” to “Kerplunk Go the Tablets” but only one Speedy Alka-Seltzer. In that sugar sweet voice all his own, the little boy with the chest of an Alka Seltzer tablet and shock of brown hair tumbling out from under an Alka-Seltzer hat sang the praises of the relief–giving tablets all throughout the Fifties. In those days before Gumby roamed the earth, the stop action technology that breathed life into Speedy seemed incredible, rendering him a favorite with both children and the adults who actually used the fizzy product many a morning after one highball too many. Speedy seemed so real you just wanted to cuddle him, to make him your own special playmate. But as we grew older, Speedy didn’t, and finally with a barely audible “plop, plop” in the early 60’s ”kerplunk” went Speedy! There in the not even yet wee small hours of the morning was the Indian Head Test Pattern, flittering across our TV screens in the place of Letterman, Leno, Conan, Kimmel, Ferguson, Fallon et al. and oft more entertaining than the lot of them. There was no such thing as all night TV, my children, and the three (count’ em three!) networks all went early to bed and not so early to rise. In their place, and all through the night, was an oddly designed screen with a series of circles and adorned with an Indian Head, as we called it in those days. Why did the test pattern feature the head of a Native American? Could it be that because we took their land, they got us back good by taking our TV? The Adventures of Ozzie and Harriet was oddly named, a show about the suburban couple next door that claimed to offer Adventures! Yet though none of the Nelsons solved crimes or explored the untamed West, Ozzie and Harriet did possess a certain quirkiness not found on most other “just dropped by to borrow a cup of sugar” shows. For one, we were never enlightened as to what Ozzie did for a living; he might have been with the CIA, sold drugs, or been the Hubcap King of Santa Monica. Harriet for her part sometimes exhibited an off-beat sense of humor, and son Ricky began as a scrawny kid who picked up a guitar and wound up a full-fledged rock legend, complete with untimely death. Ozzie and Harriet can also bid fair to be our first brush with Reality TV; as the kids grew and married, they married their real life wives on the show as well. Today only David Nelson - age 74- remains. I kinda miss his family’s Adventures. Brylcreem promised us guys that “a little dab would do us” and women cuter-than-we-could-ever-hope-for would fall into our arms. Brylcreem certainly helped Ed “Kookie” Burns make a career for himself, but I’m not sure the gooey stuff otherwise lived up to its rep. “Watch out, the girls’ll all pursue you, they’ll love to get their fingers in your hair” warbled a choir of 1950's horny gentlemen on the omnipresent commercials as a male and female puppet found romance when the male puppet’s hair went from shaggily disheveled to gloppily sheveled. Maybe primitive wooden puppets and ultra-cool Fifties' dudes achieved feminine fingers in their hair, but all I got was a greasy pompadour until one day the Beatles appeared and washed it all away. Zorro, in the sanitized Disney tradition, was a light-hearted look at a masked, mustachioed and caped crusader of Old California whose adventures exuded no sense of danger whatsoever. Talk about suspension of disbelief: Don Diego de la Vega looked, spoke, and comported himself so exactly like the alleged scoundrel Zorro that it was impossible to believe even the doltish Sergeant Garcia couldn’t figure out who he was, let alone the general populace of the future state. To add to the basic lameness of the show, the lightning strike at the opening and the very “Z” that Zorro carved were obviously animated. Still, Zorro and his brocade-clad alter ego were suavely played by Guy Williams --- later to go mustache-less on Lost in Space ---and for little kids not used to much sophistication in the 50’s, Zorro-Zorro-Zorro was fun-fun-fun! Imagine the questions you’d get if you were introducing the Hula Hoop to the world today: “How much RAM do you need? Does it play on X-Box? Is there an app for it on the I-Phone?" Well, the instructions were simply to wrap the plastic hoop with the staple in the middle about your middle, jiggle a bit, and have yourself some fun. In many ways the 50’s were less than ideal, with blatant discrimination, no civil rights act, and an environment in which you & I could be rejected for a job easy as Mom’s apple pie. 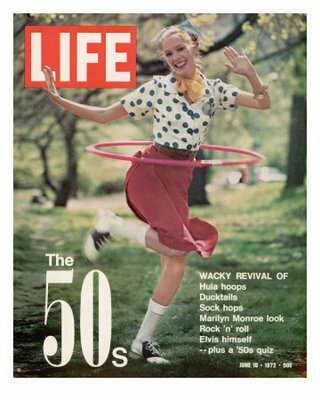 But when it came to sheer satisfaction in the simplicity of the Hula Hoop, the Fabulous Fifties were just fine! And to them, I bid a further fond farewell! What!? Don't you know that the hula hoop is used today for exercise and fitness? Yep. It's weighted and costs almost $30. And then one can wrap it around one's middle and jiggle one's bits...er...jiggle a bit... while listening to Lady Gaga's JUST DANCE. I'm just too damn old to jiggle. And even if I could, nobody'd jaggle back! I'm afraid you're just too au courant for me, Marisa! Thanks for making me feel as old as Larry King without make-up, Alan. I hope you could at least relate to my Danny Bonaduce comment a few stories back --- another Philly boy, by the way! I'd like to know if anyone remembers a commercial with the old woman saying to her headachey daughter re: whatever it was cooking on the stove, "Don't you think it needs a little salt?" and the daughter snaps "Mother, please! I'd rather do it myself!!" No one remembers that. Did I dream it? Wasn't it Excedrin Headache # 34 or something? And thanks, Perry. I feel older than ever. Sigh. At least I'm still gorgeous. Ahem. Do I remember that commercial? I wrote it and played the mother! Yes we are both old, but we can both draw the same consolation. We look marvelous! And to me, Charlie's Angels will always be Noreen Corcoran and Sammee Tong! OK, who else gets that reference? Thanks, Anna! It's great to hear from you and from someone of your generation. It helps me feel a bit less relegated to the realm of geezerdom and somewhat more in touch with whatever goes on in the world that isn't on HBO. I admit to having only a surface impression of Benny Hill. Whenever I'd briefly switch him on, his whole shtick just seemed kind of stupid, sort of like a modern Three Stooges in color. Then again, I always loved the Three Stooges so maybe I was just in an ornery mood that decade. Anyway who am I to argue with Chaplin? Hope things are going well for you in LA. BTW, here in Philly, we call it "soda" not "pop," and if you're not still young and hip at your age, then what the hell am I? You, sir, are awesome. ;-) Your post resonated because we all have those childhood memories that bring back a smile... And then sadness when we realize time is continually pushing us further and further away from that period in our lives. It's important to have writers such as yourself to be a touchstone for the rest of us. Maybe I didn't grow up when you did, but even your mention of Hill brought back a flood of emotion tied to my childhood (hence my defense of him). Thank you for that! Yes, I don't think you grew up when I did. You're not too old to jiggle! Ah Brylcreem, the Axe Body Spray of its day. It seems marketing hasn't really evolved much in 50 years, hmmm? Great post, Perry! Yes, it's true. I get rejected just as readily with Axe Body Spray as I did with Brylcreem. Thanks for your nice comment, Mike! This is a very funny guy, folks, whom you should also follow. But wait, no, don't unfollow me first! This will be a good reference for me in another 15 years when I can't remember my childhood any longer. Good post! Oddly enough, when I think of Benny Hill, I think of Chitty Chitty Bang Bang (he was the toymaker). And Johnny Depp, et al is about to bring the Lone Ranger back to the forefront, just not our Lone Ranger. I don't get the Charlie's Angels reference, but I do know who Noreen Corcoran and her siblings were ... you couldn't watch too many shows from that era that had a child that wasn't a Corcoran. And what's with this new Kool-ade character on commercials? Not our pitcher of summer fun. I'm actually enjoying these wonderful journeys into my past (even if some were through reruns). In your reply to Julie, that was the Charlie's Angels reference - LOL, I'm old, but not losing my mind completely .... and with your reference to Niece Kelly .... now I get it. Bachelor Father, right? I never liked Benny Hill the comedian, so in my humble opinion, you aren't giving him short shrift. But then again, I don't get most of the British humor, er, humour much anyway. And I agree on the mask thing ... but then again, I never figured out how people couldn't see that it was Clark Kent in those tights ... like a pair of glasses disguises someone?